The sugary bliss of sitting on your rump and eating ice cream is a hard feeling to beat. 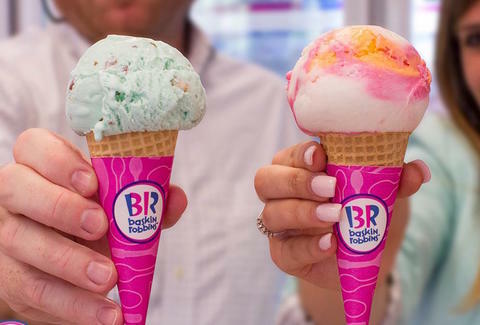 The only complement to that scenario might be having ice cream whisked to your door, but luckily for you, Baskin-Robbins is making your slovenly dreams comes true. Feel free to sit back down on the couch. On Thursday, the company announced a new delivery service in partnership with DoorDash, which will enable anyone with an internet connection and address to order a glut of traditional items from the menu. This includes ice cream cones, sundaes, milkshakes, ice cream sandwiches, banana splits, and even whole quarts of ice cream, among others. However, none of the desserts will include whipped cream because it usually melts in transit, unfortunately. The service is available in 22 cities including Atlanta, Chicago, Dallas, Houston, Las Vegas, Los Angeles, Nashville, New York City, Phoenix, Sacramento, San Diego, San Francisco, Seattle and Washington, DC, according to a press release. All you have to do is use DoorDash's app or website to place an order, and pay a $2.99 processing fee to get the ice cream train rolling to your house. Then, let the food coma begin. Baskin Robbins is launching the service in conjunction with a good deed: On July 14, the company is delivering free Mint Chocolate Chip Polar Pizzas to children's hospitals in select cities across the country. Polar Pizza samples will also be available for free at participating stores nationwide from noon to 5pm on the same day. To get started, check out Door Dash, or download the app. Then get ready for a whole lot more ice cream in your life.